When playing a song, you usually get two audio channels in the same file, which is all good, but things can get complicated if you want to edit a specific channel in the audio file. This is where SimpleWavSplitter comes in to help you set everything up. Its name might suggest that it splits files into two pieces, but the application's purpose is actually to split a multi-channel audio track, in WAV format, into separate mono files. 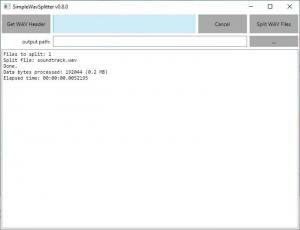 SimpleWavSplitter is offered completely free of charge, and it's available for Windows and various Linux platforms, but only the 64-bit editions. It comes in a ZIP archive, and you need to extract its components, without going through an installation process. Furthermore, the software doesn't require any special tools or services, and it doesn't use a significant amount of resources. Splitting an audio file with this application is one of the simplest things you will ever do. You only need to click a button, on its clean and straightforward user interface, select a file and pick a destination folder. The software will save the file's right and left channels as separate WAV files in just a second. A full log of the operation is displayed in the largest part of the interface, so you will know exactly what happened and if anything went wrong. Besides splitting files, you can also retrieve a wide range of details about them. Simply load a file, either through a browsing option or by dragging and dropping it on the interface, and the log area will fill up with a massive amount of information, which includes the file's size, number of channels, sample rate, bitrate, header size and much more. This is a good course of action if you wish to know in advance what kind of results you might get from splitting the file and what to expect when editing the results. Processing your audio tracks with SimpleWavSplitter can give you many more possibilities when editing them in your favorite audio processor. You can split multi-channel WAV files into mono files. The process is straightforward and extremely easy. You can also retrieve numerous details about your audio files. The application is only available for 64-bit operating systems. You can download SimpleWavSplitter free here.